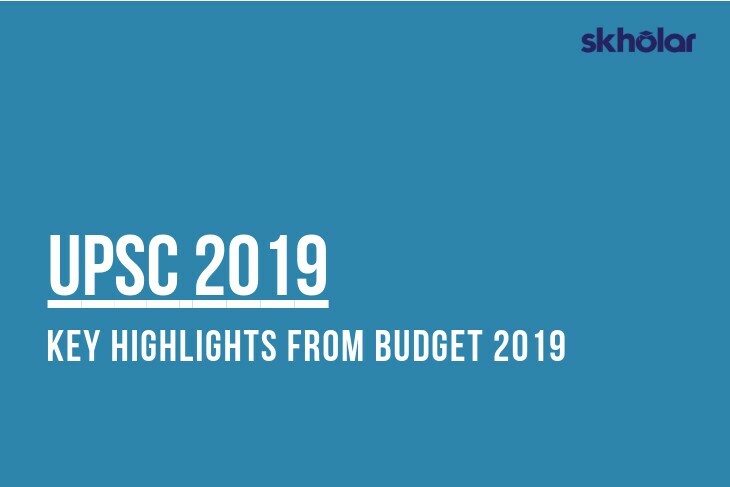 Here’s the key highlights of Budget 2019 that you must study for UPSC 2019. This post is brought to you by Skholar, a complete dedicated platform for civil services exam aspirants. You can now visit Skholar, take a Free UPSC 2019 Mock Test and get All India Standing. Happy Learning. Fiscal deficit brought down to 3.4% in FY19. All income tax returns will now be processed in 24 hours and refunds will be issued simultaneously. Thebenefits under Sec 80 (i) BA being extended for one more year, for all housing projects approved till end of 2019-20. Government launches Mega Pension Scheme,Pradhan Mantri Shram Yogi Mandhan, for social security coverage of unorganised labour. The Unorganised labour will get ₹3,000 per month after the age of 60 Pensioners will have to contribute Rs 100 per month and the Government will contribute equally in pension accounts under this scheme. Two percent interest subsidy to be given to farmers involved in animal husbandry activities through Kisaan Credit Card scheme. Allocation for North Eastern states increases to 21%,amounting to Rs 58,166 crores. Sanction of 15.56 lakh loans amounting Rs 7.23 lakh crore under the Mudra scheme. ₹750 crore allocated under Rashtriya Gokul Yojana for protection of cows. ‘Rashtriya Kamdhenu Aayog‘ to be set up for implementation of policies and schemes for welfare of cows. Single window clearance to be made available for film-makers to ease shooting of films.In order to combat film piracy, Anti-camcording provision to be introduced to Cinematography Act. National Centre for Artificial Intelligence under consideration. NationalAI portal to be developed soon.